My samples for the Complex Weavers Tied Weaves Study Group Sample Exchange are ready to go. Each one is attached to a weaving record sheet which includes the draft on the back, plus a write-up of how I developed the idea. Because my barcode name draft was too large to print out, I included only part of that, but added a complete profile draft. I called my draft "Tortie Trails," in honor of its source of inspiration. .... got me thinking along other lines. I didn't intend for the sample to shrink like that, but the unexpected result made me wonder if I could do it on purpose. 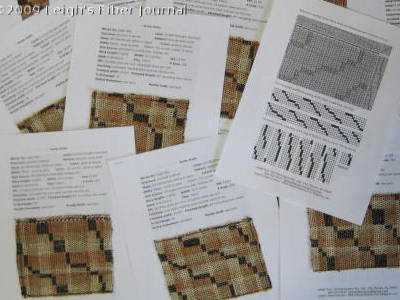 This sample is a 10/2 unmercerized cotton for warp and tabby weft, and an 8/2 rayon for pattern weft. I read that rayon tends to shrink more than cotton, so hopefully this will give me a similar effect to Catzee's cloth. 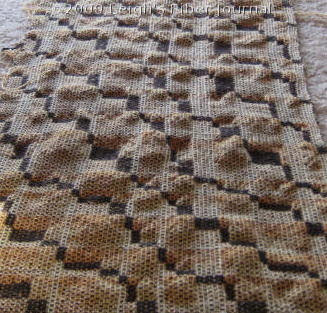 This one is more in the proportions of a scarf, so if it works, I can wear it! As with many of my sources of inspiration, one idea leads to another. 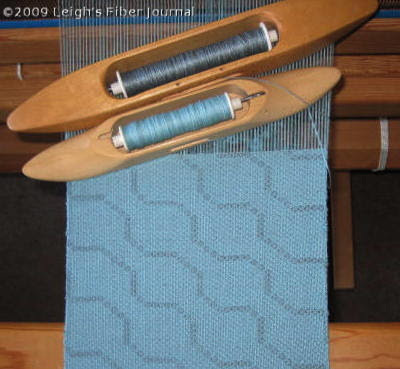 The result of this is that my weaving experience seems more like a journey than a classroom experience. But it's hard not to follow the evolution of ideas. In fact, I doubt I could do it any other way. I look forward to seeing what happens next! Your record sheets and samples look well presented, and it's a very interesting sample for anyone to receive. I love that you're running with this! This is very exciting, I look forward to see the result! It's great that your taking your unexpected result, and figuring out a way to make it work for you!! Your samples look great. I now can't wait to see how this one turns out! And isn't a journey much more fun than being in a classroom???!! I'm sure your samples will be well received. Wonderfull presentation! I'm so happy you feel your weaving experiences are a journey and you're sharing your journey with us. I for one am enjoying and learning from every new blog.